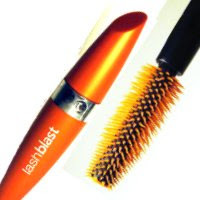 Over the past few days, I have been wearing Covergirl's new mascara, LashBlast in black brown. The mascara gives you super long lashes without too many clumps. My lashes were very thick and noticable, but not as defined as I would have liked. Some of my lashes stuck together and the mascara was harder than normal to remove. Don't get me wrong, this product succeeds in giving you long, bold lashes. I would recomend this mascara to anyone who wants BIG lashes with a LOT of volume. Overall, this mascara is a blast! I love this product! I use it too! I was just getting ready to put this on my blog! You beat me too it! haha. Is Orange the New Bronze? A Cool Touch For Your Eyes! An Extra Boost to Your Eyes!